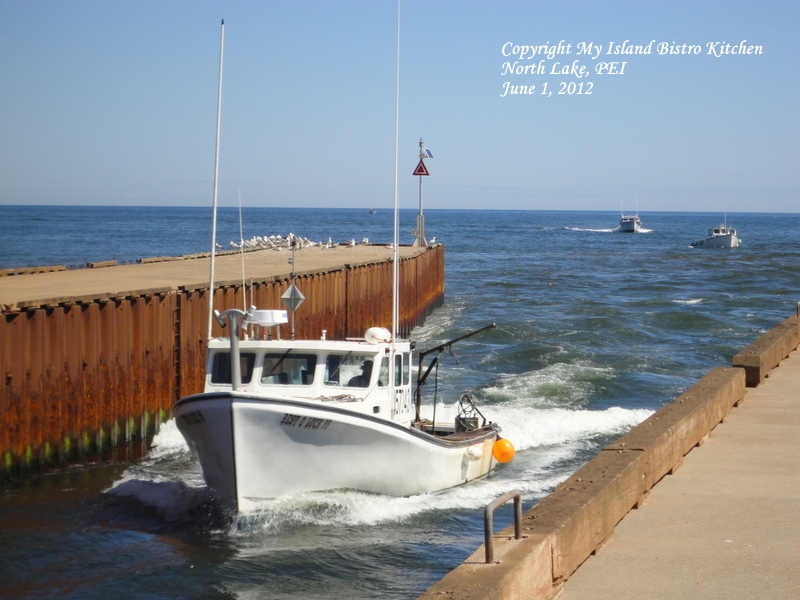 The opening of the spring lobster season on Prince Edward Island is always an event. Fishing boats, laden with lobster traps like those in the photos below, depart wharves around the Island in the very early morning to set their traps, often going several miles out to sea. This is called “setting day” and it is not uncommon for people in the local fishing communities to head to their local wharves to see the fishing boats off. Setting day 2013 was yesterday, April 29th. 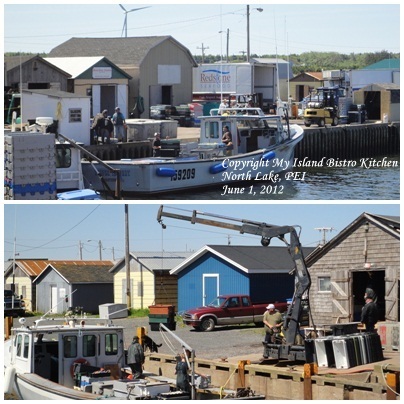 I didn’t make it to a wharf yesterday or today but I am sharing some photographs I took during fishing season 2012. Several communities also have church services known as the “Blessing of the Fleet” services on the Sunday before setting day. These are sometimes held inside nearby local churches but, most frequently, they are held on the wharves of the fishing ports. Today was the first day of the season that fishers could check their set traps and bring in their catches. 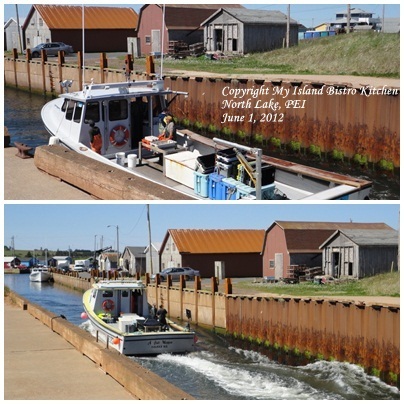 The photos below were taken at North Lake Harbour, PEI on June 1, 2012; however, the same scene would be playing out today at many harbours across PEI. And, here are the “goods”! 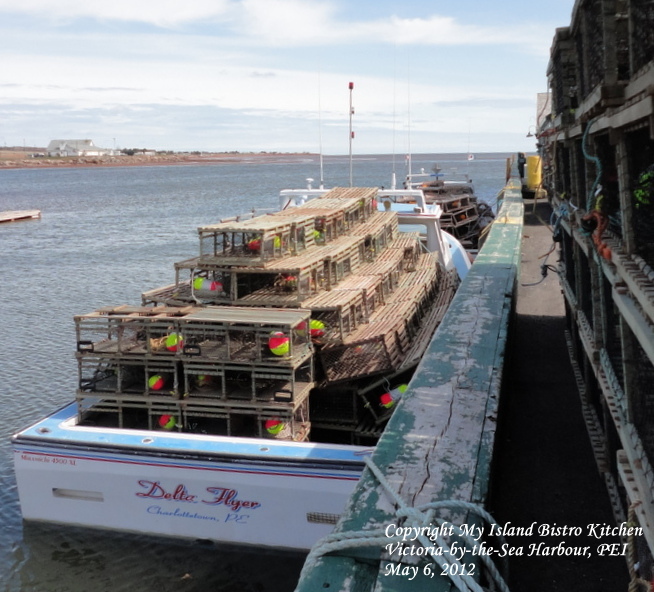 “The Prized Cargo” – Fresh PEI Lobster! Boats at rest after their day’s work fetching the catch. 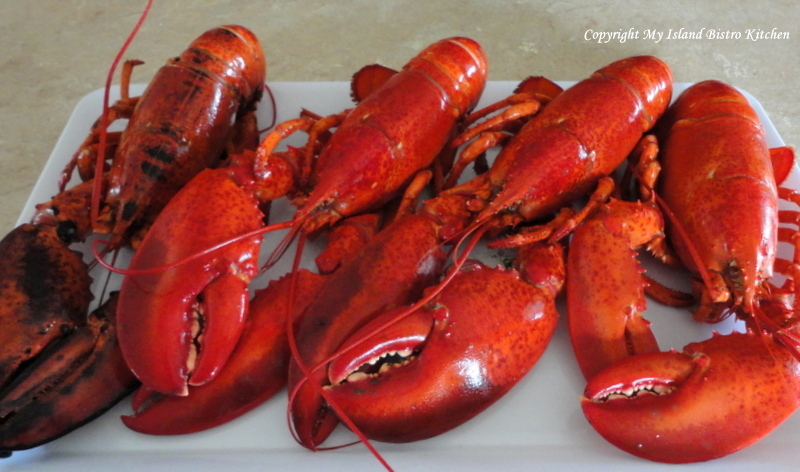 And, once they are cooked, look at the fabulous rich color of these freshly caught PEI lobsters! Many Islanders will be dining on fresh lobster for supper this evening. 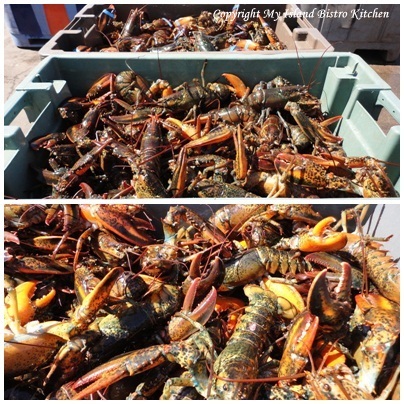 For many, it is a tradition to have fresh lobster on the first day of the catch. 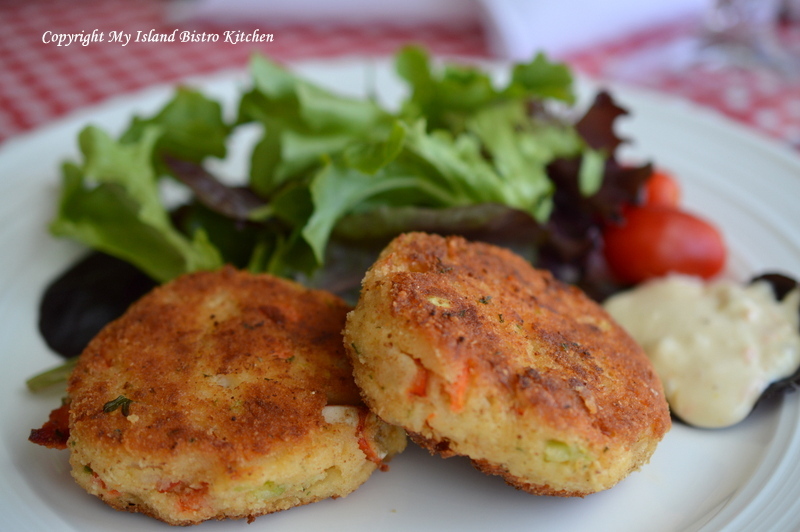 This is one of the benefits of living on an Island – we have plenty of fresh seafood. Many (including myself) will argue that lobster from the spring fishery is better than lobster fished later in the summer from waters that have warmed up over the season (even though lobster from the later catch is very good, too). I don’t know why it is but lobster from the cold Atlantic water always does seem to taste better and I think even has a better texture meat. I remember the first time I was on a Caribbean cruise many years ago, ordering lobster from the dinner menu. My taste buds were salivating for what I knew to be lobster taste. Oh my! It didn’t taste like lobster at all as I know it. That’s when I discovered the difference in taste of lobster that comes out of cold water and that out of very warm waters! I never ordered lobster from a cruise ship menu again. I wait for the good PEI lobster at home! The ironic part of this is that I never liked lobster when I was growing up. In fact, when the family would be chowing down on lobster, my mother always roasted me a chicken! However, they convinced me to try a bite of it when I was probably about 18 years old and I’ve never looked back and have more than made up for it since! 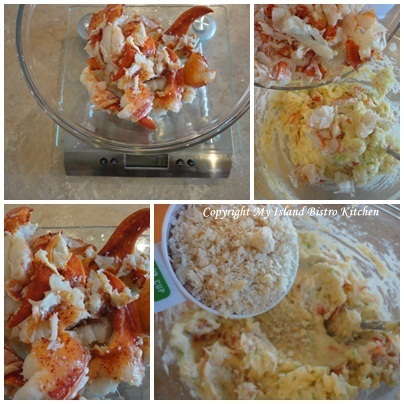 I love lobster by itself and in just about any other recipe imaginable! 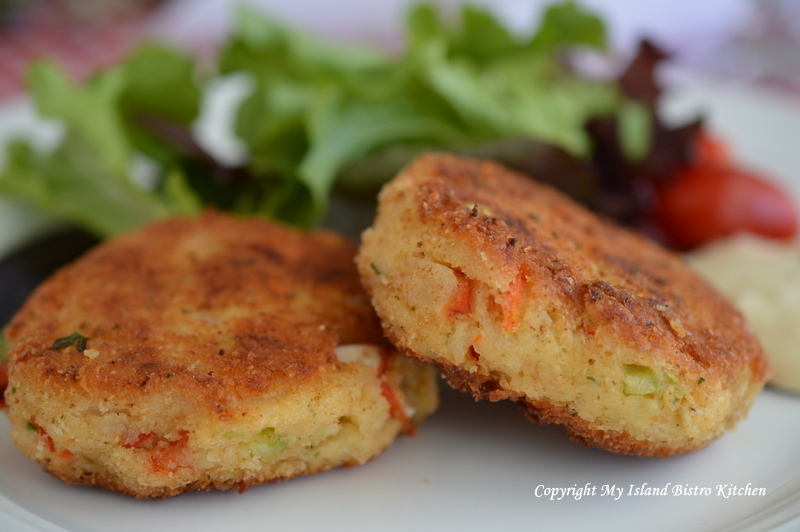 So, tonight, I am dining on Lobster Cakes to celebrate the opening of the 2013 PEI lobster fishery season and am sharing my recipe with you. 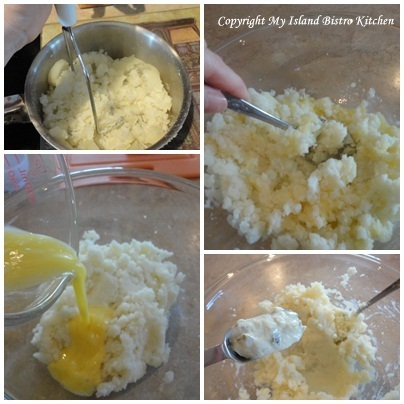 Place warm mashed potatoes in large bowl. Add beaten egg and mix well. Add tartar sauce. 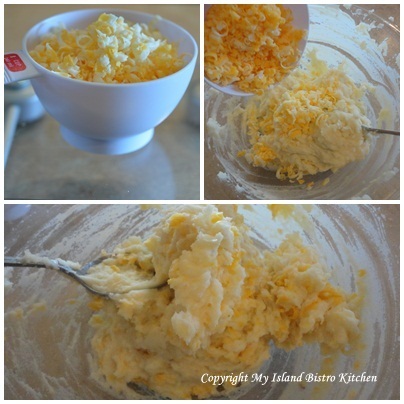 Stir in grated cheddar cheese. Add dillweed, parsley, and pepper. Stir in scallions, celery, and red pepper. Lastly, add the lobster and mix well. 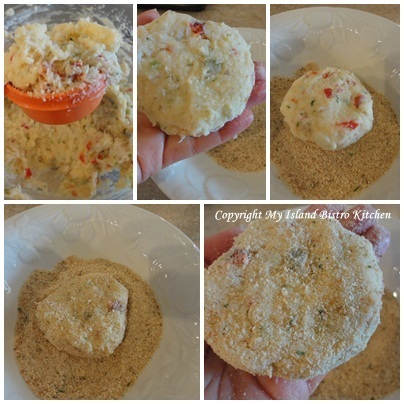 Add just enough of the first amount of bread crumbs so the mixture will hold together and can be formed into patties. 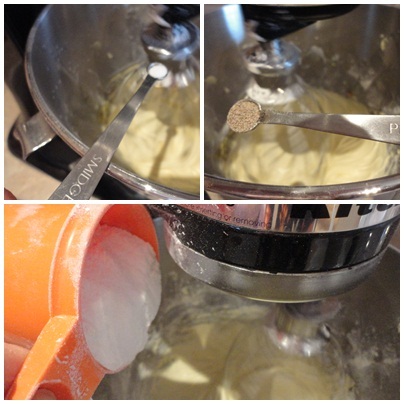 Using ¼ cup measuring cup, scoop up mixture and form into round patties. In shallow bowl, place the seasoned bread crumbs. 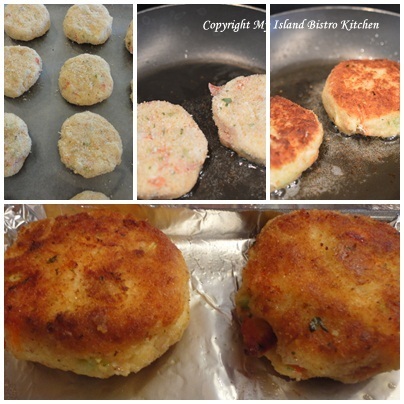 Dredge each patty in the bread crumbs until completely covered on all sides. Place on wax-paper lined baking sheet and chill for 1 hour to allow flavours to blend and for patties to become firm so they won’t break apart when sautéed. Heat oil in non-stick skillet over medium-high heat. 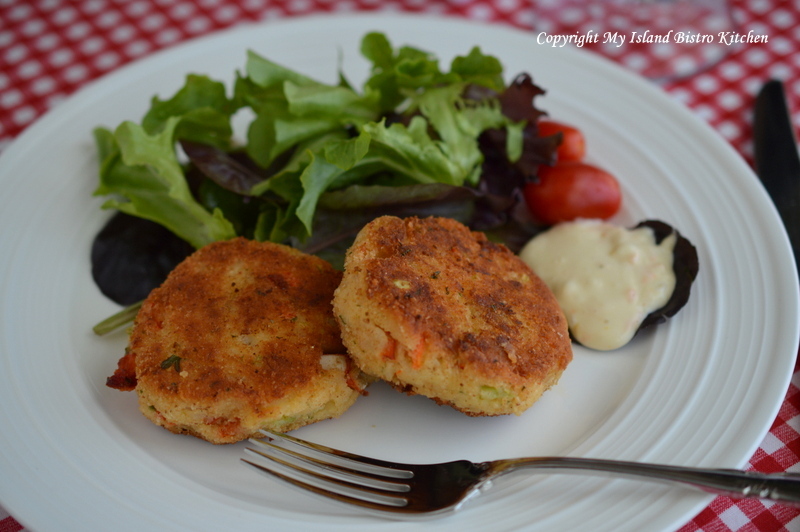 When oil is hot, reduce heat to medium and sauté lobster cakes 2-3 minutes on each side, until golden brown. 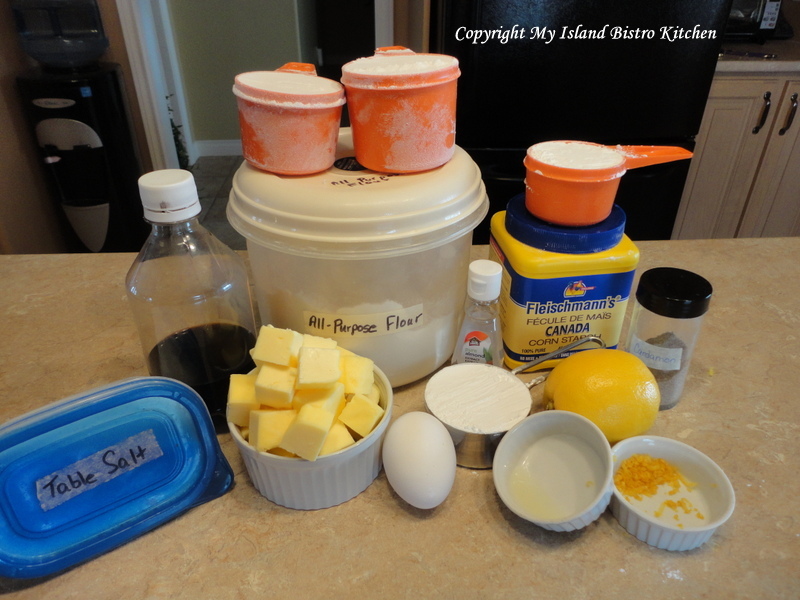 Transfer browned cakes to greased baking sheet. Bake in oven 6-7 minutes to finish the cooking process and allow cakes to become firm so they will hold together. 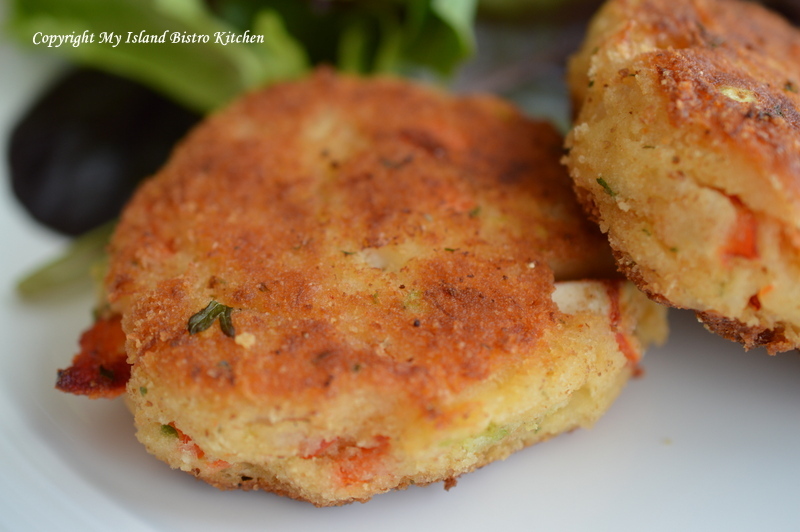 Serve lobster cakes, 2 per person, hot with citrus aioli or your favorite tartar sauce and a side of green salad. These cakes freeze well, uncooked. When ready to serve, simply remove cakes from freezer and thaw. Sauté and bake as described above. Okay, so my recipe is actually eight layers, but who is counting when the meal is as tasty as this one is! Seven-layer dinner (sometimes called “Shipwreck”) is really little more than a full dinner in a casserole and baked in the oven. I grew up (as I am sure many of you have) with this vintage meal served on a regular basis. 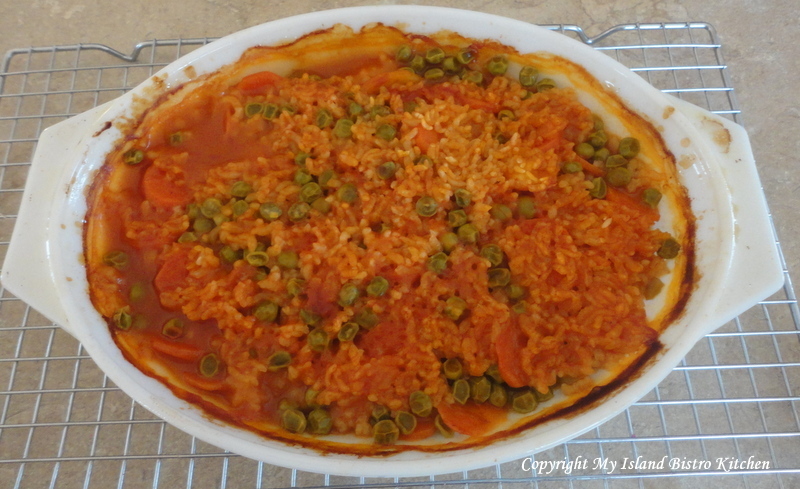 The seven main ingredients are: 1) onions, 2) meat, 3) potatoes, 4) celery, 5) carrot, 6) peas, and 7) rice. Sometimes, it’s a six-layer dinner depending on what veggies I have on hand and sometimes it might be eight or nine layers thick. I like to add parsnip because it adds a level of sweetness. Sometimes, I will slice turnip very thinly and add it as well. Frozen corn also works in addition to the frozen peas or instead of. In that regard, it is almost a potluck dish! 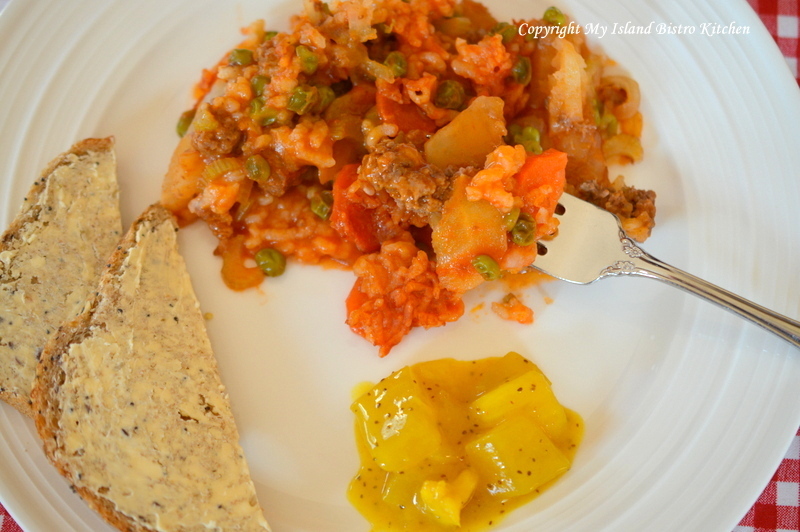 It has probably been named “Shipwreck” because it can be made with pretty much any vegetables you happen to have on hand as well as different kinds of meats, such as ground beef or sausage and it is also an economical way to stretch the meat content. In many households, it can be made with what is on hand without having to go shopping and it doesn’t take any kind of exotic or hard-to-find ingredients. This is an old-fashioned hearty meal. Have you noticed that many of these old “stand-by” meals are becoming popular again? On a regular basis, I tend to cook with a fair bit of seasonings and spices. However, this is one dish that I never add anything to it other than salt and pepper and the onion for flavour. 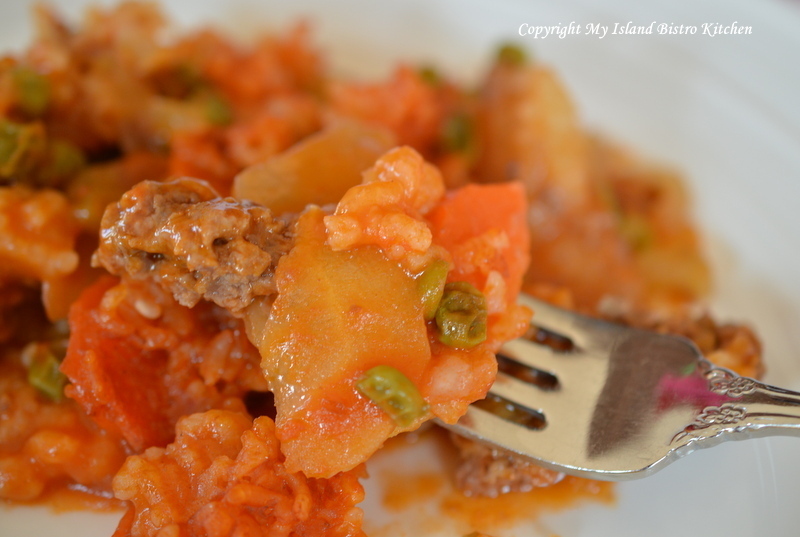 In my home, I grew up with this recipe being made with ground beef (we never used any other kind of meat in it) so, as April closes out as the month on PEI to promote local beef, I am sharing my recipe for this simple comfort food. 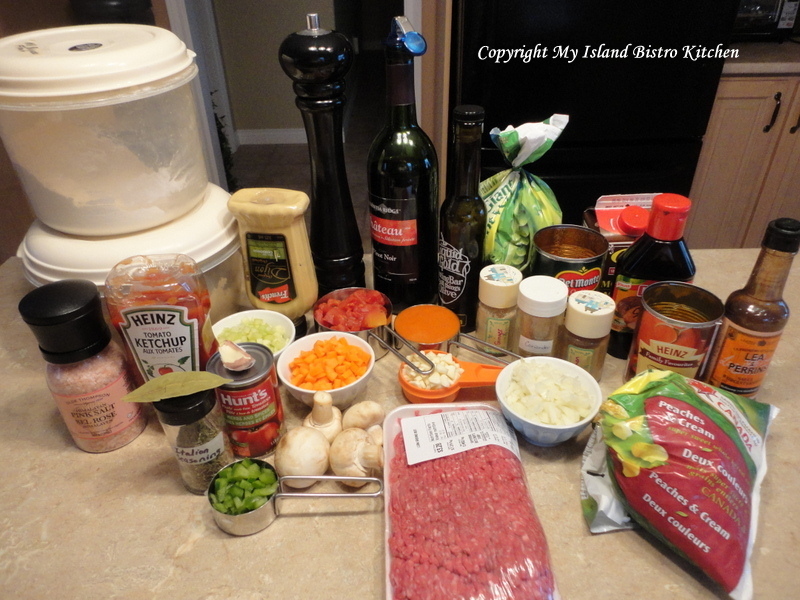 The beef I used for this casserole is 100% Island beef and was purchased at KJL Meats, a local butcher shop in Charlottetown, PEI. This is a great meal to make when you have little time for meal preparation and clean-up because all the veggies, the rice, and the meat cook together in the one casserole so there are no pots and pans to wash (bonus!) other than the dish it bakes in. And, your kitchen will smell divine when this is baking in the oven! If there happens to be any leftover, this meal carries over well and, in fact, the flavours seem to become even richer the next day when it is reheated. Grease 2-quart casserole. 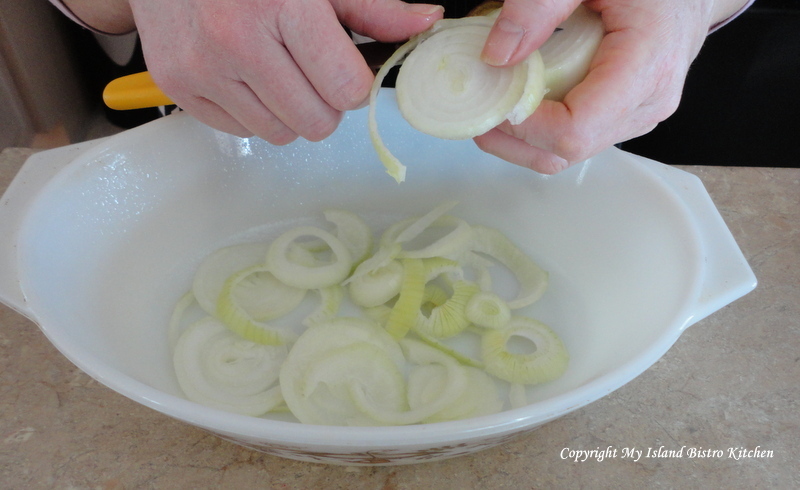 Peel and slice onions to make first layer of casserole. 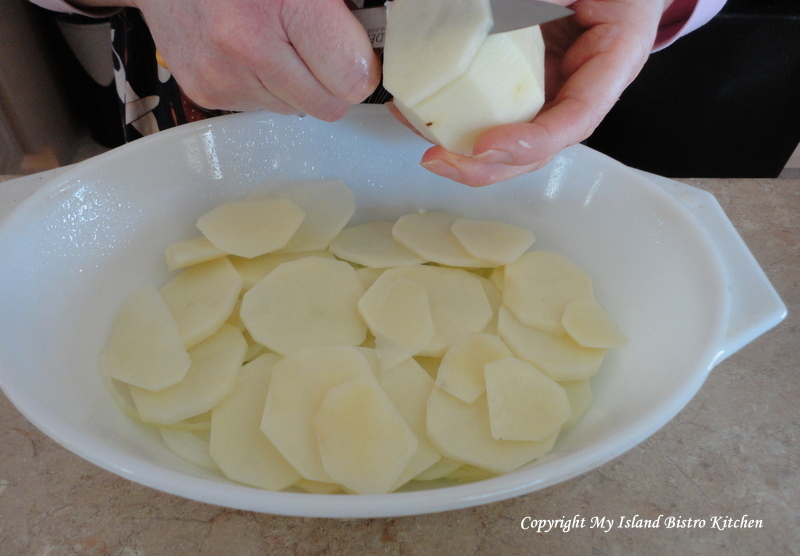 Add the layer of sliced potatoes and sprinkle with salt and pepper. 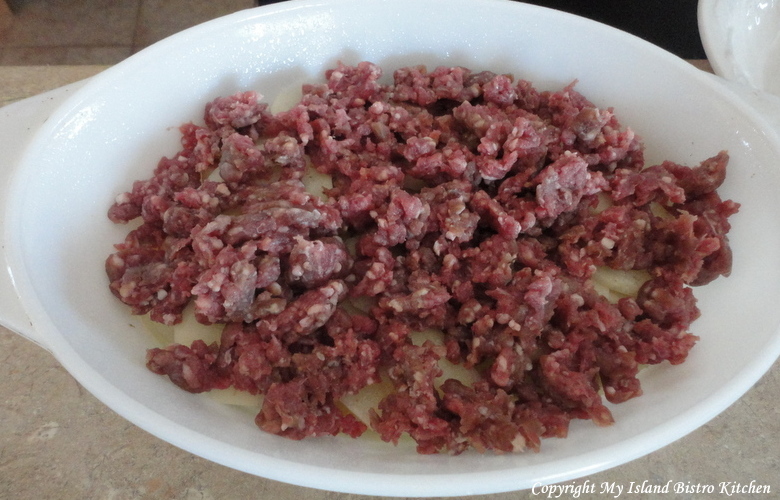 Add the layer of ground beef. Sprinkle with salt and pepper. 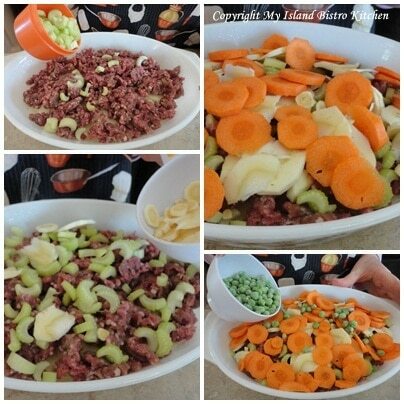 Add celery, parsnips, carrots, and frozen peas. Sprinkle with salt and pepper. Sprinkle ingredients with rice. 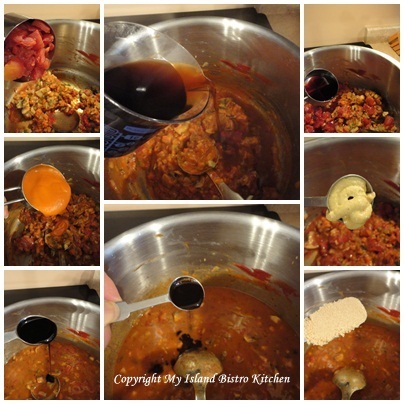 Cover casserole ingredients with can of tomato soup. Pour one soup can of water over top of ingredients (or, if you wish, you can mix the soup and water together and pour as one over the casserole ingredients). Cover and bake at 350F for 1 ½ – 2 hours until vegetables are tender. It is hard to plate this meal attractively but its taste more than makes up for its lack of presentation! Suggested Serving: Serve with homemade mustard pickles and whole grain artisan bread. Thank you for visiting “the Bistro” today. For the third consecutive year, April has represented Burger Love on Prince Edward Island. Yes, that’s right, love of beef burgers! This year, 31 restaurants across the Island paid a $600 entry fee to cover advertising and promotion costs to participate in the month-long celebration of Island beef. PEI Burger Love has certainly created a hype and brought patrons to a number of Island restaurants to sample the array of gourmet beef burgers that chefs have created specially for the event. Make no mistake about it, these are not your average hamburgers. These are gourmet burgers that require a hefty appetite to do them justice. PEI Burger Love, created by Fresh Media, is carried out in partnership with Prince Edward Island Cattle Producers, PEI Department of Agriculture and Forestry, PEI Flavours, PEI Potato Board, and the PEI Restaurant Association. The formation of this collaborative group has brought heightened awareness to PEI’s beef industry. In its inaugural year in 2011, a total of 14 Island restaurants participated with 5500 burgers being served in the month of April. Last year, 22 restaurants signed on and, collectively, sold over 16,000 burgers in just one month. I suspect, by the time, the event ends on April 30th, the number of beef burgers consumed on PEI in the month of April, 2013, will have surpassed 2012 figures. For the month of April, one would be hard-pressed to go anywhere on the Island without hearing some talk about PEI Burger Love. In workplaces, on the street, and just about anywhere, one could hear Islanders enthusiastically talking about and describing the burgers they had already tried and the ones still on their list. Social media has been used extensively in this awareness campaign and burgers have suddenly become the hottest and most photographed subjects around! Servers would bring burgers to the tables and, all of a sudden, cameras and cell phones appeared and started clicking! Photographs of burgers have been everywhere, including on twitter and on Facebook. This year, for the first time, PEI Burger Love engaged nine individuals, one of whom was me, to use blogging as a platform to further advertise the Burger Love campaign. Overall, I believe Islanders have embraced this campaign and have had a lot of fun with it. It has not been uncommon throughout the month to see groups of as many as 20 heading to the local restaurants at any day at noon to try out the burgers. Even local businesses got in on the action. Staff of Century 21 Colonial Realty in Charlottetown, for example, select one restaurant a week, call ahead with their burger order, and then their entire team of real estate agents show up en masse with a video camera in tow. Joel Ives says they have been doing this since Burger Love began and find it’s a fun activity for their team while supporting local at the same time. Says Joel, “Our business is about being local – local homes, local businesses, and being in the community. We do our best to support local initiatives. When PEI Burger Love came out, we thought we could have some fun with it by going as a group to eat lunch together, have some laughs, and make some fun videos. Since all of our agents are busy doing their own thing, it is great that we can book off one lunch a week during the [Burger Love] campaign to get together.” You can check out the Century 21 fun videos here to see how one local business has embraced PEI Burger Love. Diners are engaged in Burger Love fever too as they head to local dining establishments to order up the creative burgers. They can rate the burgers they eat by voting online for their favorite and win great prizes in the process as well as help crown the most popular burger in the 2013 Burger Love campaign. April is traditionally a slower month for local restaurants because the tourist season hasn’t yet started but, this year, participating restaurants are hopping busy as burger lovers converge on their establishments to sample the many burger options. Linda Dickie, Food and Beverage Director at Mavor’s Restaurant in the Confederation Centre of the Arts, says they chose to participate in PEI Burger Love because they like to support local whenever possible and it brings awareness to the restaurant. According to Linda, Mavors sold 1700 burgers in the first couple of weeks of the campaign with the highest single day servings of 210 burgers! Chef James Oja, who owns and operates The Big Orange Lunchbox restaurant in downtown Charlottetown, is a first-time participant in PEI Burger Love. He says the annual PEI Burger Love campaign “generates a busy month giving restaurants that participate a little warm-up for summer”. Chef Oja claims Island beef is the best beef in Atlantic Canada and that his “supplier, Bluefield Natural Products, provides superior beef that is richer in iron, antioxidants, flavour, and texture”. Just How Many Burgers Can You Eat? As I mentioned earlier, I was one of nine guest bloggers for PEI Burger Love this year and my assignment was to sample four of the burgers and blog about them. Now, I thought four burgers was a lot to consume in a little over a week. However, Connor Jay set himself the challenge to eat all 31 burgers….and he did… in just 14 days! Averaging two a day plus three on two different days, he proudly says there was one day that he ate two of these huge burgers within two hours! Asked why he decided to set out to eat all 31 burgers, Connor says he thought “it would be something fun to do and would be a great way to experience the Island“. He says he “loves the PEI Burger Love campaign and thought eating all 31 [burgers] would be a great opportunity to get other friends involved in it and that it would inspire them to go grab a burg“. I am also aware of a workplace where employees would order a couple of burgers from each of 3-4 restaurants for lunch each Friday in April, bring them back to their workplace, and cut them into quarters so that co-workers could have the opportunity to sample as many of the burgers as possible. 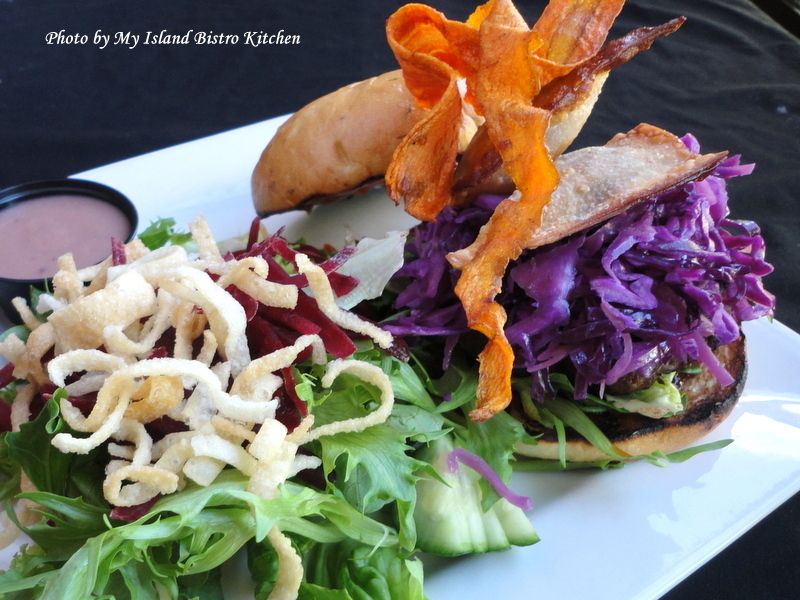 What’s in a Gourmet PEI Burger Love Burger? Other than the requirement to use 100% Island beef in the burgers, chefs had unfettered licence to dress the burgers with whatever toppings they wanted and to prepare and present them as creatively as they wished. Suffice it to say that Island chefs rose to the challenge and created some mighty fine culinary creations with unique flavour combinations. 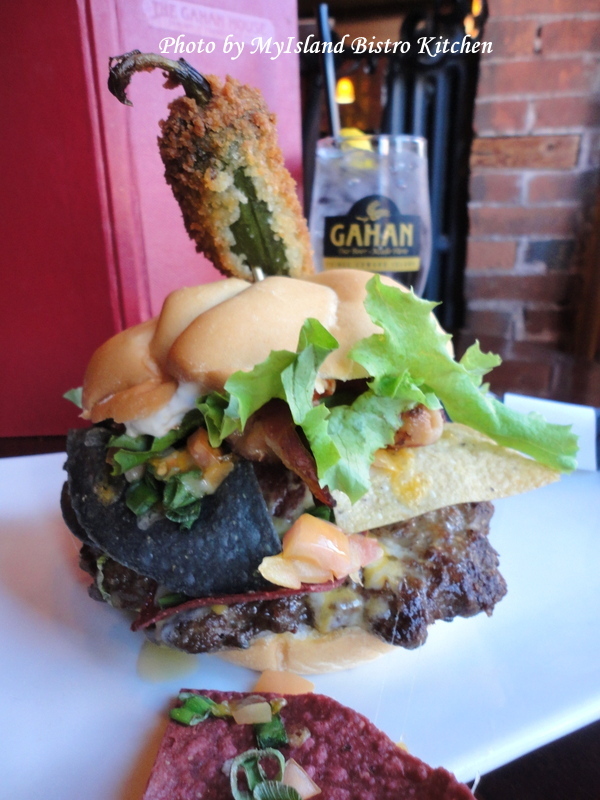 From the Gahan House in Charlottetown, PEI, comes the “Not’cha Burger” that features Tortilla chips, salsa, spicy cheese dip, and Jalapeno mayo to accessorize the beef burger. 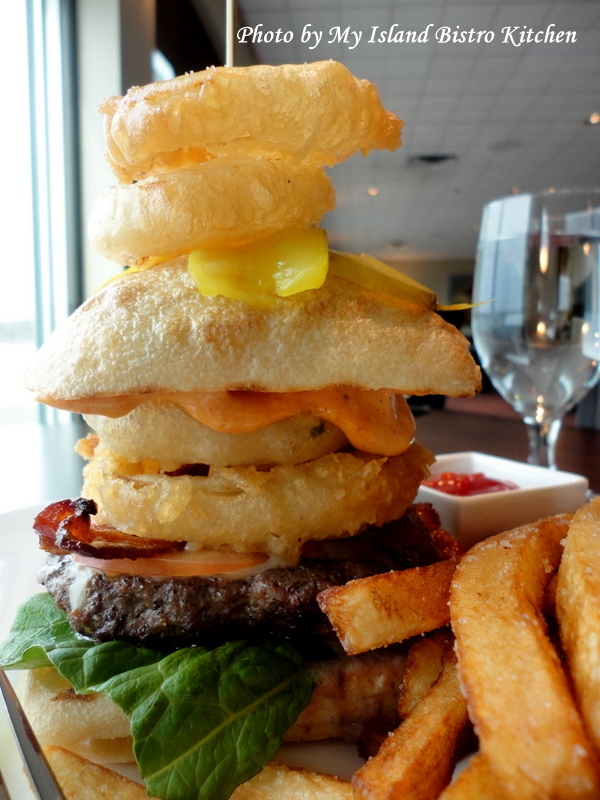 The “Canadian Legend Burger” was created by the Lucy Maud Dining Room, a teaching restaurant in the Culinary Institute of Canada. 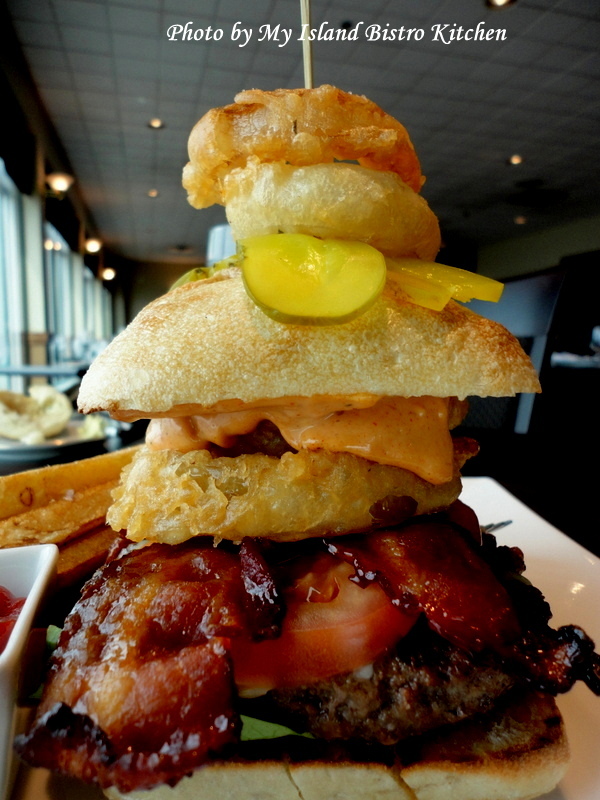 It features a gouda-stuffed burger accessorized with smoked tomato aioli, confit cherry tomato, bacon jam, candied bacon, and the best onion rings I have ever tasted. 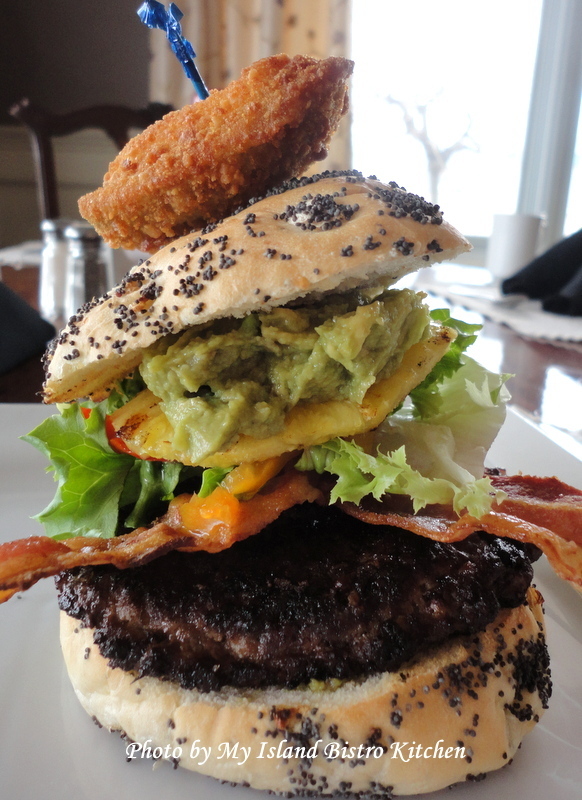 The Prince William Dining Room of the Loyalist Inn in Summerside, PEI, presented the “Big Kuhuna Burger” that featured smoked bacon, banana peppers, a grilled pineapple ring, and guacamole. The Old Triangle in downtown Charlottetown created the “Mr. Miyagi Burger” that included Hoisin BBQ sauce, Asian slaw, and caramelized onion wontons. As you can see, these are huge, well accessorized burgers! If I had one suggestion for organizers for future PEI Burger Love campaigns it would be to consider also offering smaller versions (perhaps even slider size) for those who don’t have large appetites but yet who want to try out the burgers. The gourmet burgers, on average, are in the $12-$14 range (burger only). So, Islanders, only 6 days left to get out and try some of these gourmet burgers before PEI Burger Love 2013 ends. This is a great way to show support for the local beef industry as well as the many Island restaurants which have chosen to participate in this campaign to promote Island beef. There is a burger out there for everyone’s taste! The statistics are in for the 2013 Burger Love Campaign. A total of 46,204 beef burgers were sold in 31 participating restaurants during the month-long event in April. This translates into 21,917 pounds of beef consumed during this time period. Sales for the burgers during the month of April are estimated at $580,008.62. Voters selected “The Smokin’ Fox” from Phinley’s Diner in Stratford, just across the bridge from Charlottetown, PEI, as their “Most Loved Burger 2013”. Not bad, PEI, not bad at all! 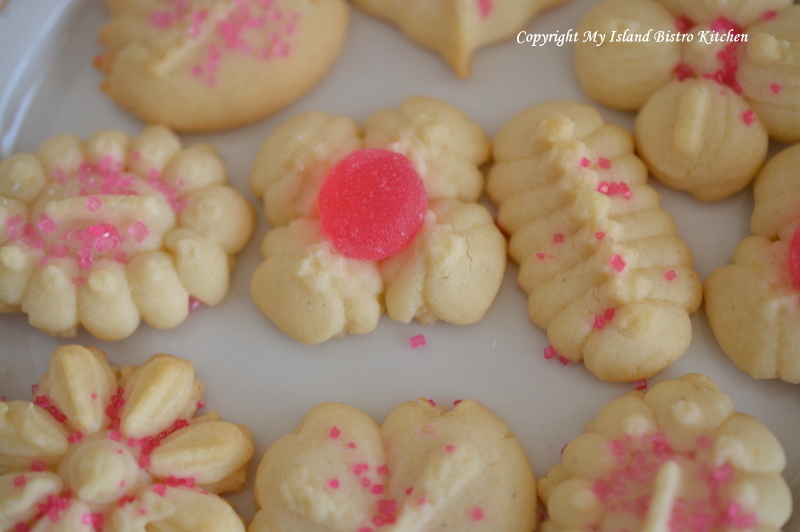 Spritz cookies are dainty-shaped cookies that are crisp and buttery. They are made by pushing soft cookie dough through a cookie press which is a cylinder fitted with a decorative disk that has patterned holes through which the dough is “squirted” or pressed into shapes. 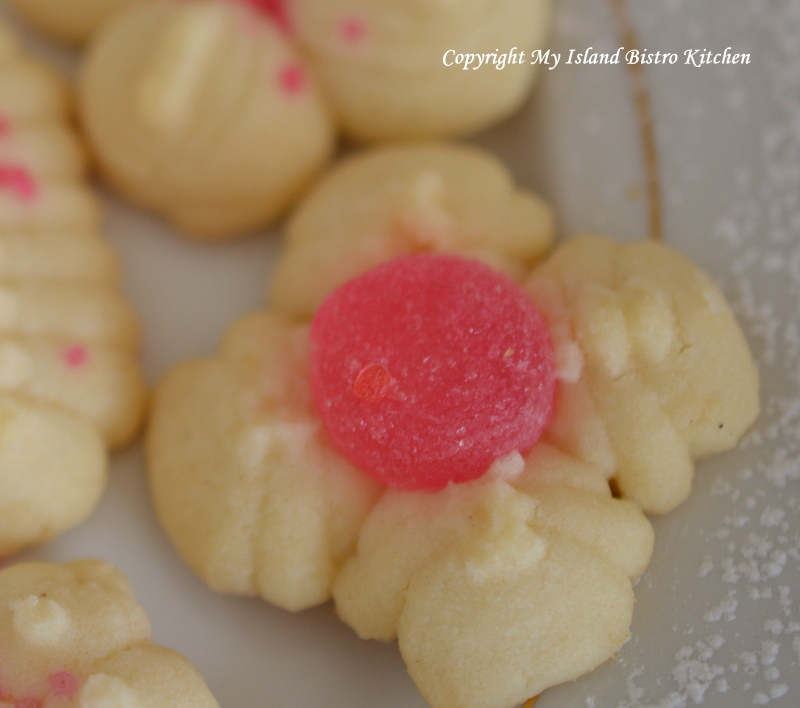 Typically, cookie presses come with many different decorative disks – mine has probably 20 or more. 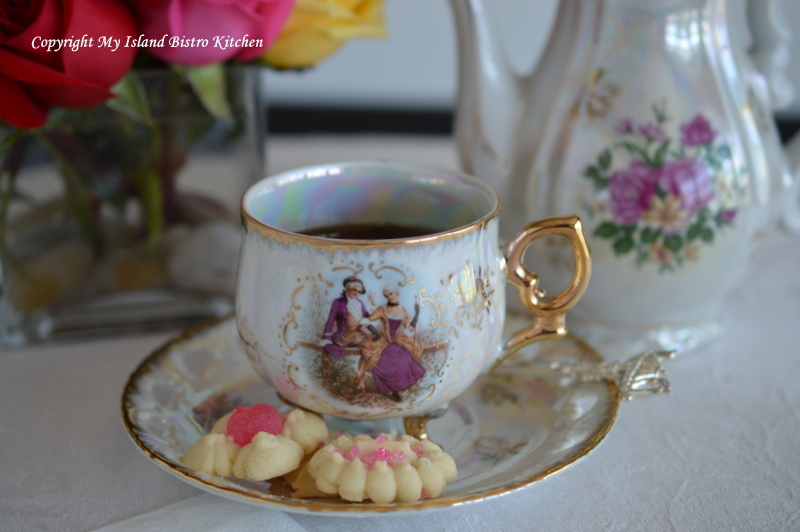 These cookies are popular at Christmas, special occasions, and are very suitable for afternoon teas as they can be made in so many different shapes and colors and can be further embellished with icing, colored sugar, miniature gumdrops, or dragées. 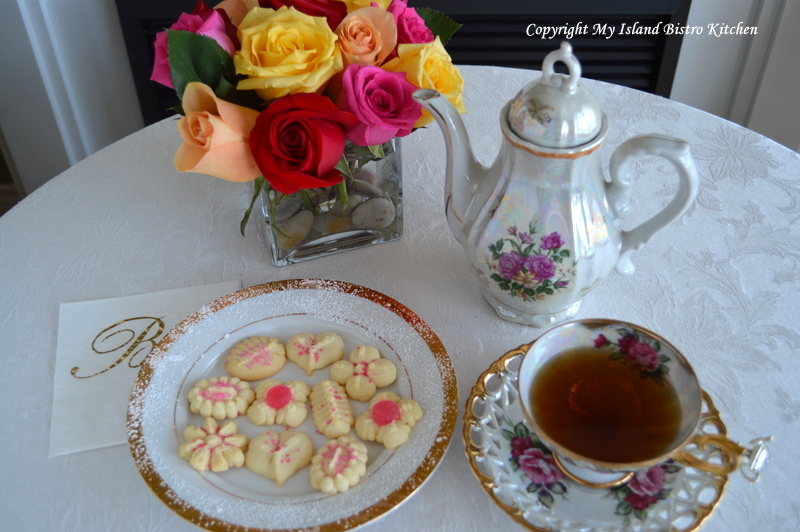 My recipe for Lemon Spritz Cookies is buttery rich and delicate. I like the flavour burst of lemon juice and zest in these petite cookies. This recipe does best when the dough is chilled for 24 hours to allow the egg yolk to get fully incorporated and absorbed into the other ingredients. Unlike most liquids, such as water or milk, for example, eggs take a lot more time to become incorporated into the dry ingredients. 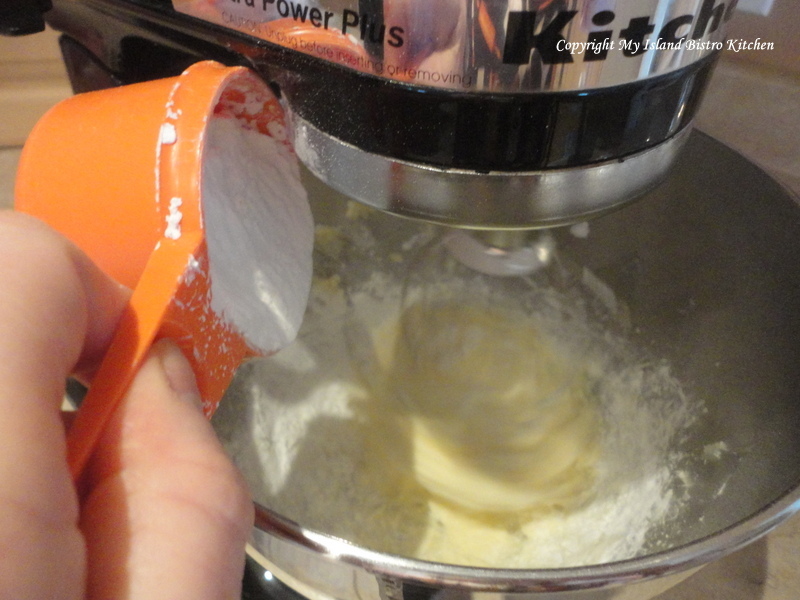 When the dough comes out of the refrigerator, it will be too hard to push through the cookie press so let the dough sit at room temperature for about an hour or so until it becomes pliable enough that it can be formed into a roll that can be inserted into the cookie press cylinder. You’ll notice this recipe has no baking powder or soda. This is because that would cause the cookies to raise which, in turn, would result in them losing their shape and design that makes them spritz cookies. Cream butter and icing sugar. 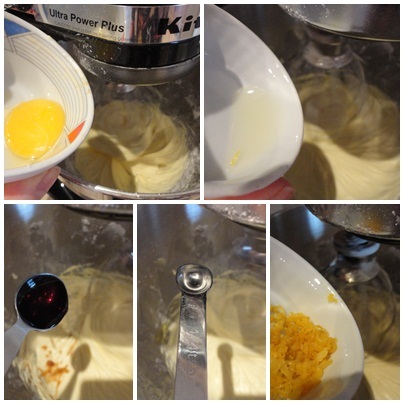 Add egg yolk, lemon juice, vanilla, almond flavouring, and lemon zest. Add the flour, salt, and cardamom to creamed mixture, stirring until well combined. 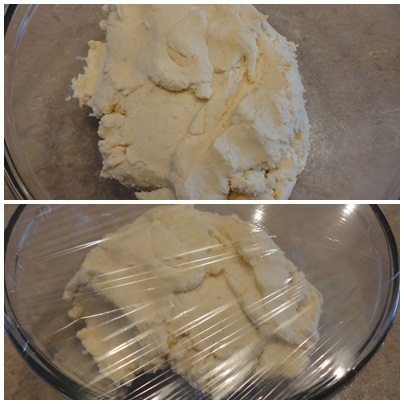 Cover dough tightly with plastic wrap and place in refrigerator for 24 hours. Remove dough from refrigerator and let sit at room temperature for apx. 1 hour. 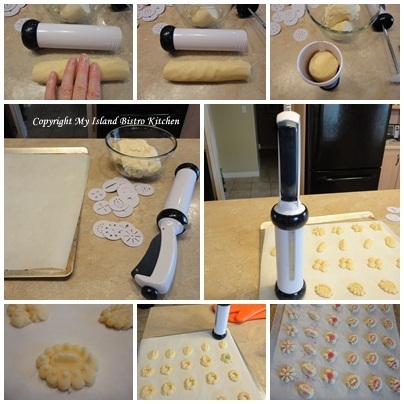 Form dough into a roll that will fit inside the cookie press cylinder. Insert dough roll into the cookie press. Line cookie sheets with parchment paper. 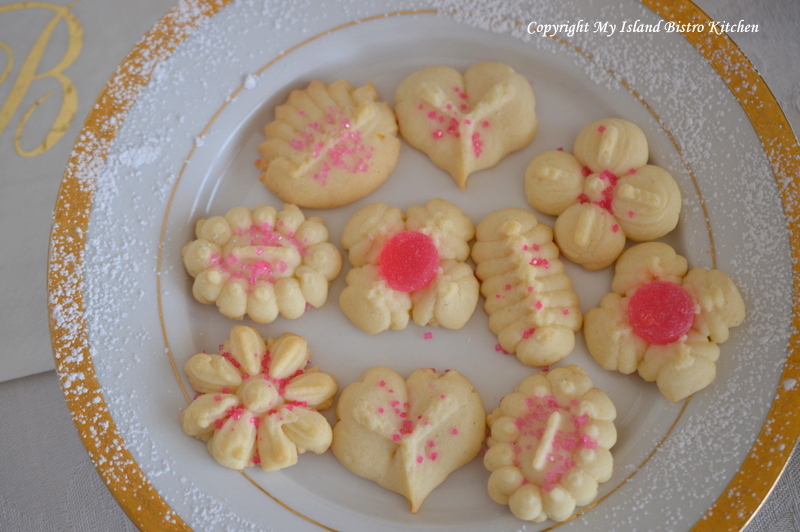 Follow manufacturer’s directions for your cookie press to form the cookies into decorative shapes. Decorate with colored sugar, if desired. Bake at 400F for 7-8 minutes. Watch the cookies closely as their high butter content and small size means they will burn easily and quickly. Let cookies cool on baking sheets for 2-3 minutes then transfer them to wire racks to finish cooling. 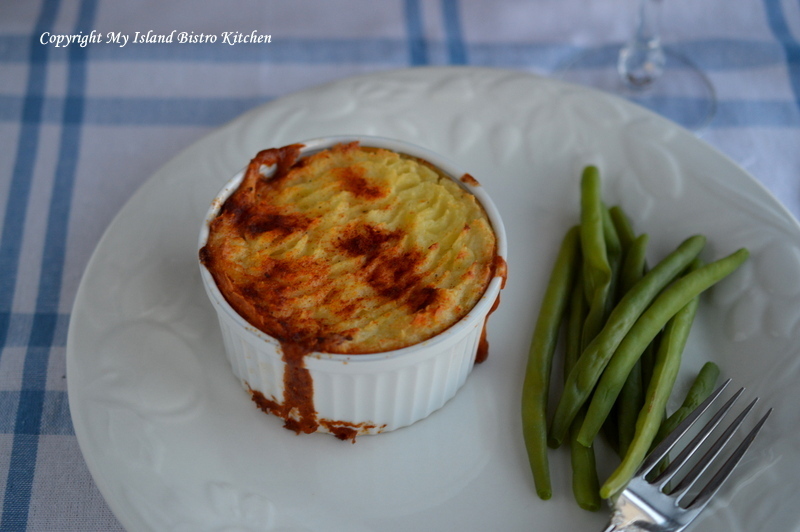 I first had Cottage Pie (although I didn’t know that’s what it was) many years ago as a small child at Camp Segunakadeck (Seggie) on the south shore of PEI. I came home from summer camp raving about this yummy dish and trying to describe it to my mother. As a seven or eight-year old, my descriptions of culinary delights would not have been enough for even a seasoned professional chef to be able to concoct some resemblance of the meal. The description would have went something like this…there was hamburg and ‘stuff’ on the bottom and mashed potatoes on the top and it was made in a large pan. Many years later when I would recall my camping experience, I was always reminded of this dish which I have since come to realize was likely a version of Shepherd’s or Cottage Pie, most likely the latter. 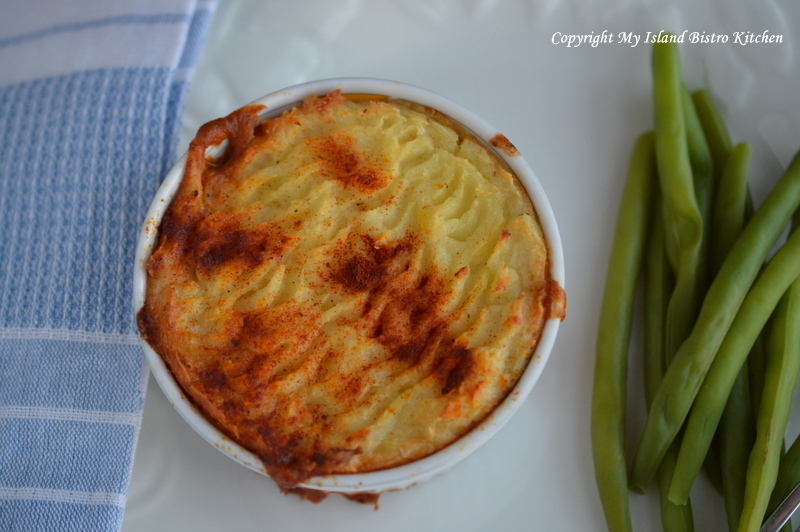 In the years since, I have tried many recipes for Shepherd’s Pie or Cottage Pie but none were very flavourful and I was never satisfied with the result. One thing I learned not so long ago is that, while both have a cover of mashed potatoes on top of the meat, there is a difference between the two: Shepherd’s Pie is made with ground (or minced) lamb and Cottage Pie is made with ground (or minced) beef, more commonly known as hamburg. So, while many of us use the generic name “Shepherd’s Pie” when referring to this dish, if we are using ground beef, then it’s really Cottage Pie we are making. 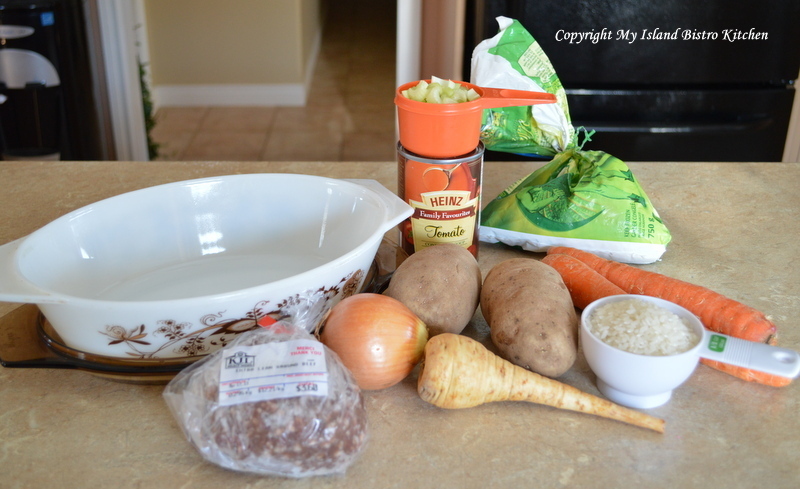 The great thing about Cottage Pie is that you can add any veggies you like (or eliminate any you don’t) or you can make it primarily with meat and very few vegetables. The recipe I have created for my tomato-based Cottage Pie contains a lengthy list of ingredients and, I will forewarn, it does take a bit of time to make. However, the end result is worth the effort and this comfort food freezes well (unbaked) so it’s a great dish to have on hand in the freezer for busy nights when everyone arrives home hungry for dinner and no one has the energy to make a fulsome meal from scratch. Serve the Cottage Pie with string beans, asparagus, or a green salad. Heat 1 tbsp olive oil in large frypan. Brown meat over medium-low heat. Drain off any excess fat. Set aside. In large saucepan, heat 1 tbsp olive oil. 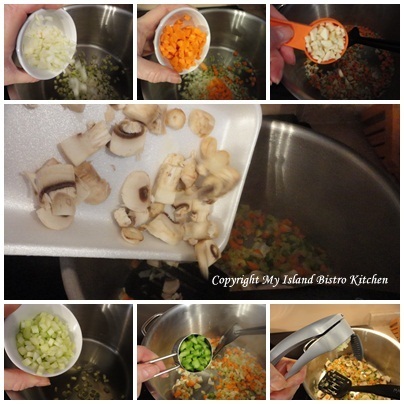 Sauté onion, carrot, parsnip, celery, green pepper, and garlic for 3-4 minutes over medium-low heat. Add mushrooms. Sauté for 2-3 minutes. 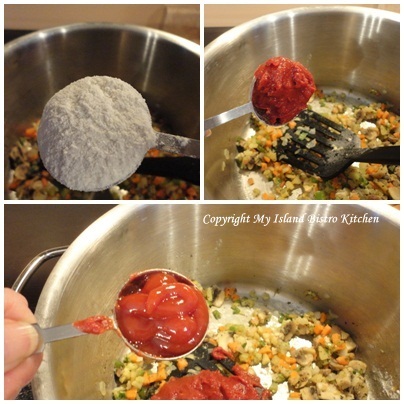 Sprinkle flour over the mixture and stir in tomato paste, tomato sauce, and ketchup. Cook 1-2 minutes. Add canned tomatoes, tomato soup, red wine, Worcestershire sauce, Dijon mustard, beef broth, salt, pepper, molasses, and brown sugar. Bring to a boil. Immediately reduce heat to medium-low. 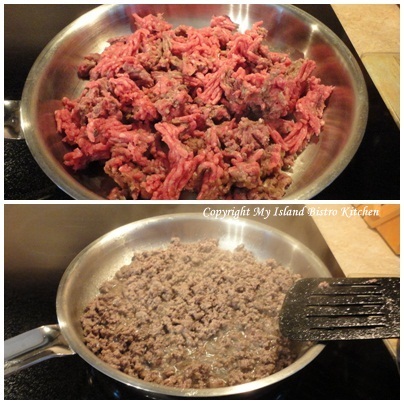 Add cooked ground beef and spices. Cook 3-4 minutes until mixture is heated. 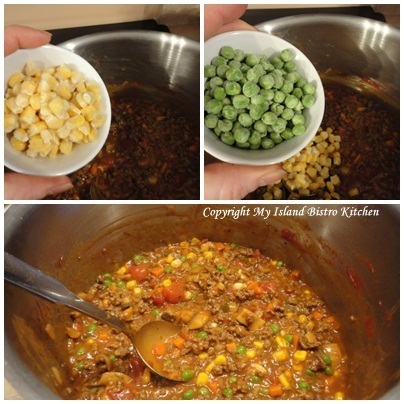 Add frozen corn and peas and cook 2-3 minutes longer. Remove from heat. 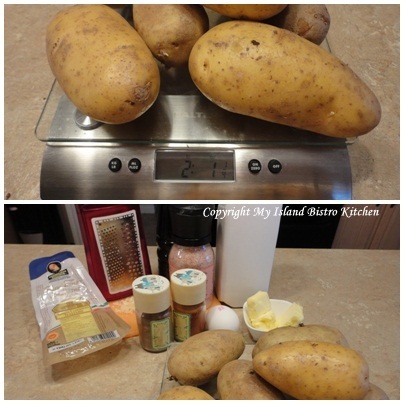 Cook potatoes. Drain. Mash. 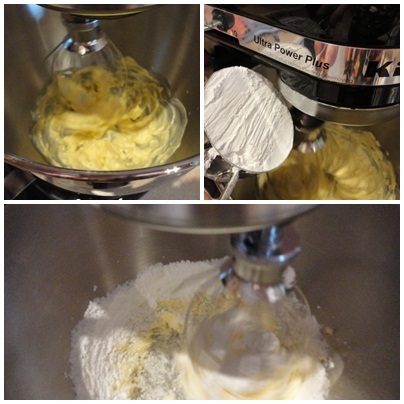 Transfer mashed potatoes to bowl of stand mixer and whip for apx. 2 minutes on high speed with milk, egg yolk, salt, pepper, butter, nutmeg, and grated cheese (I used Parmigiano Reggiano). 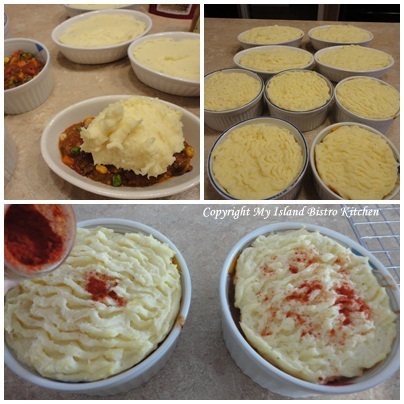 Spray casserole dish or individual ramekins with cooking spray. 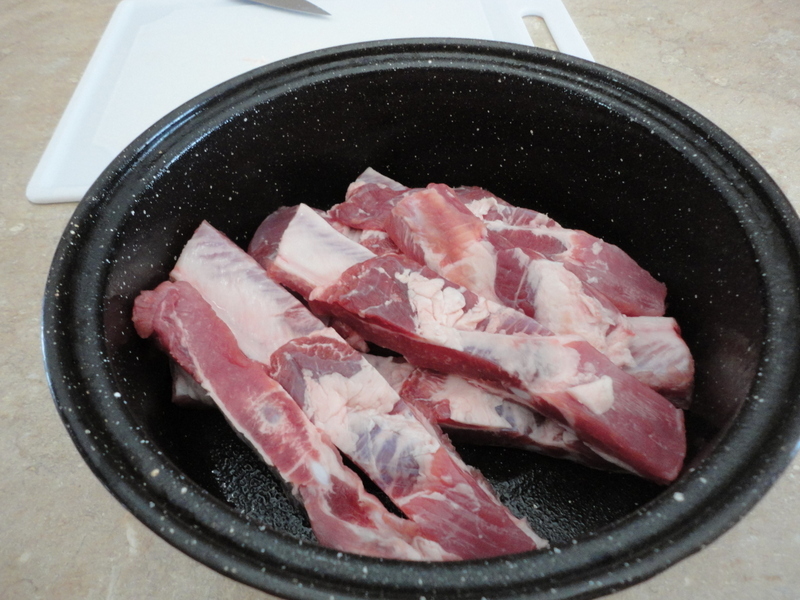 Remove and discard bayleaf and spoon meat mixture into dishes, filling each a scant ¾ full. 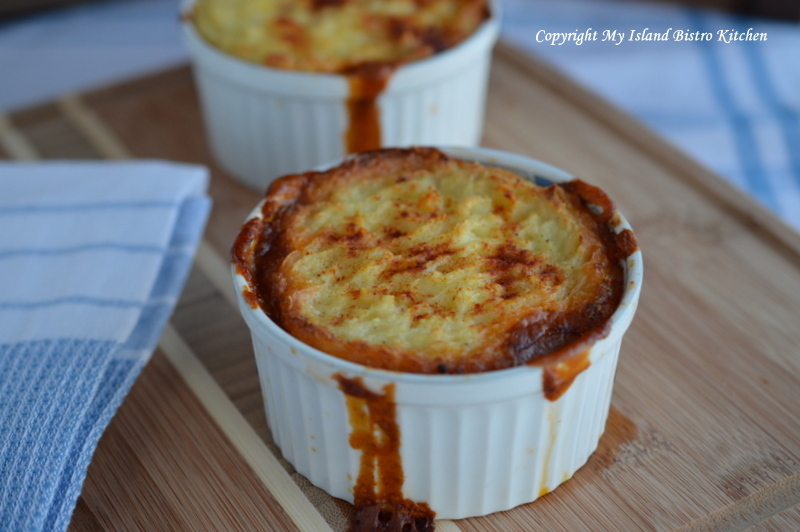 Top with spoonfuls of whipped potatoes to the top of the casserole or ramekins. 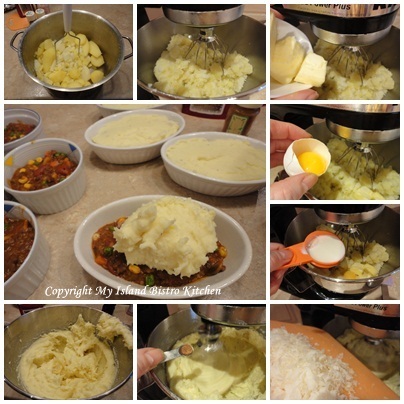 With knife, gently spread potatoes so meat mixture is entirely covered. 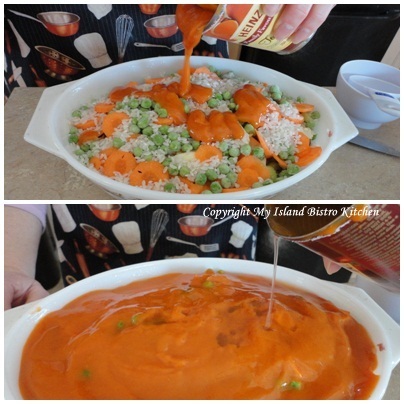 Using tines of a fork, create a decorative pattern on the potato topping. Sprinkle with paprika. Bake, uncovered, 30-40 minutes, until topping starts to brown. Remove from oven and let stand 8-10 minutes. Serve with steamed green beans, asparagus, or a green salad. 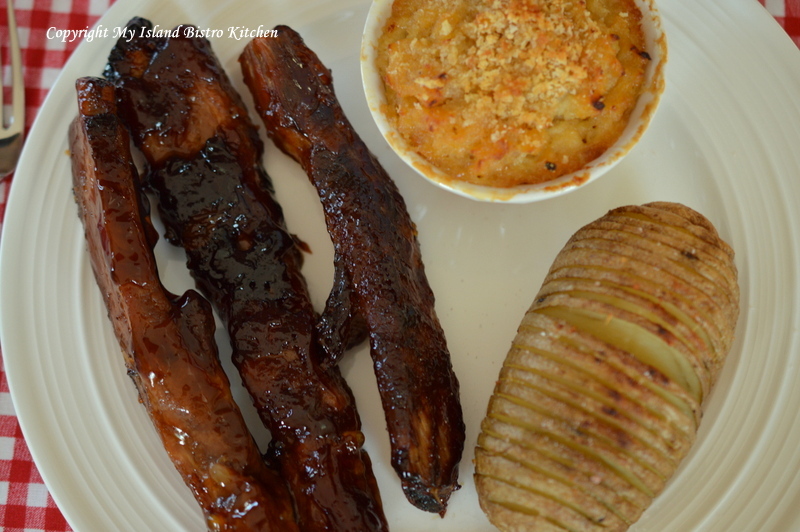 Today, I am sharing my favorite recipe for Honey Garlic Spareribs. 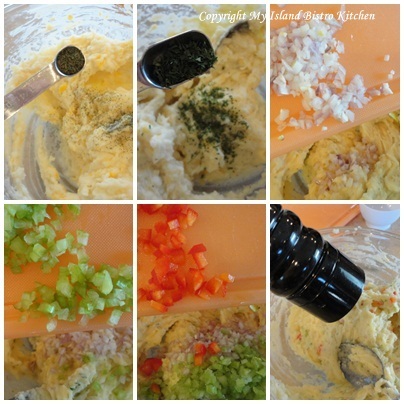 This is a recipe that has been used by my family for many years. 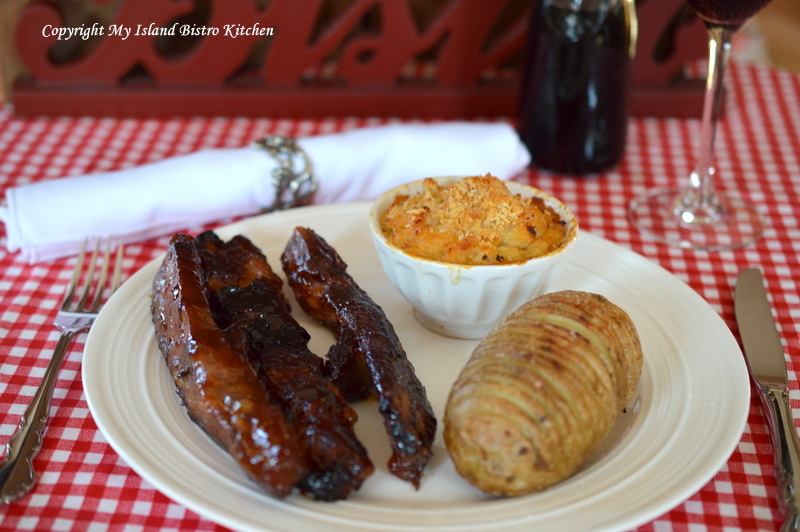 Sometimes we serve the ribs with rice and other times with baked potato and a side vegetable. 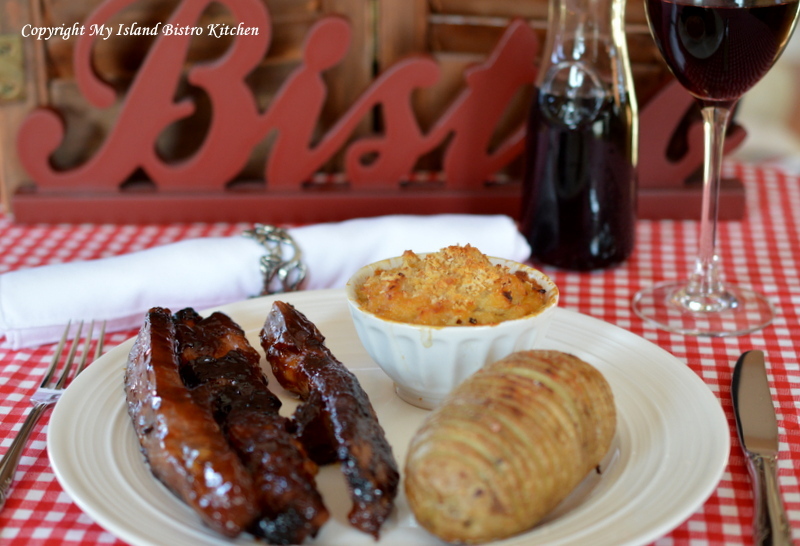 This evening, I served the ribs with turnip casserole and a variation of a traditional baked potato. I used baker potatoes and sliced them not quite all the way through into thin slices. I then drizzled Liquid Gold’s Organic Tuscan Herb Infused Olive Oil over them and added some herbs and garlic powder along with small dobs of butter in between some of the slices. I placed the potatoes in tin foil loosely gathered up around them and baked them in the oven. 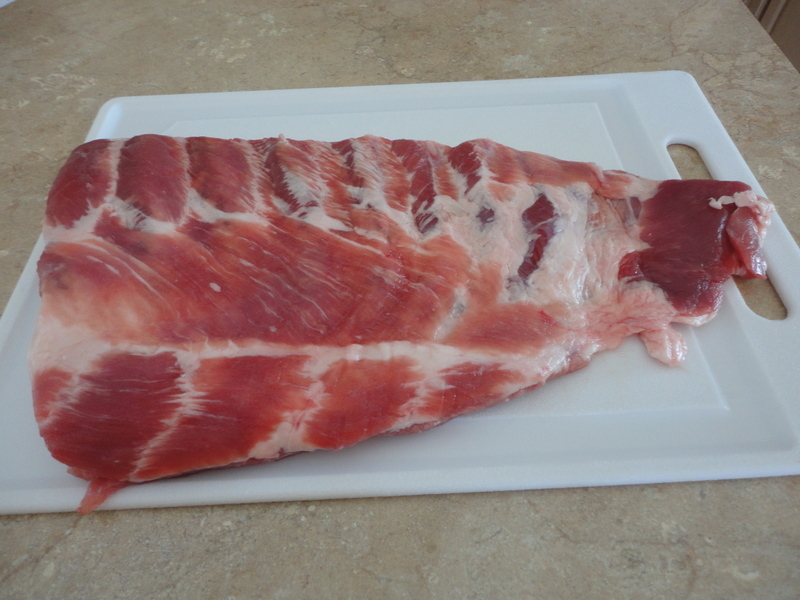 When preparing the ribs for roasting, I suggest lining the roaster with heavy-duty tin foil as this sauce thickens and makes it difficult to clean the roaster. I forgot to do that this time and washing the roaster was not a fun task. 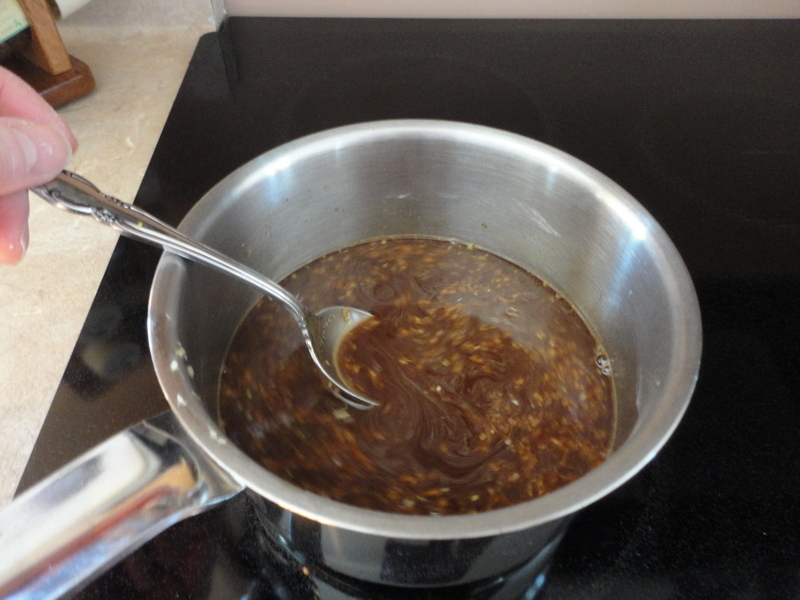 When making the sauce, heat it only until it reaches the boiling point. Don’t worry about thickening it on the stove as it will thicken further after it has been poured over the ribs and cooked in the oven. 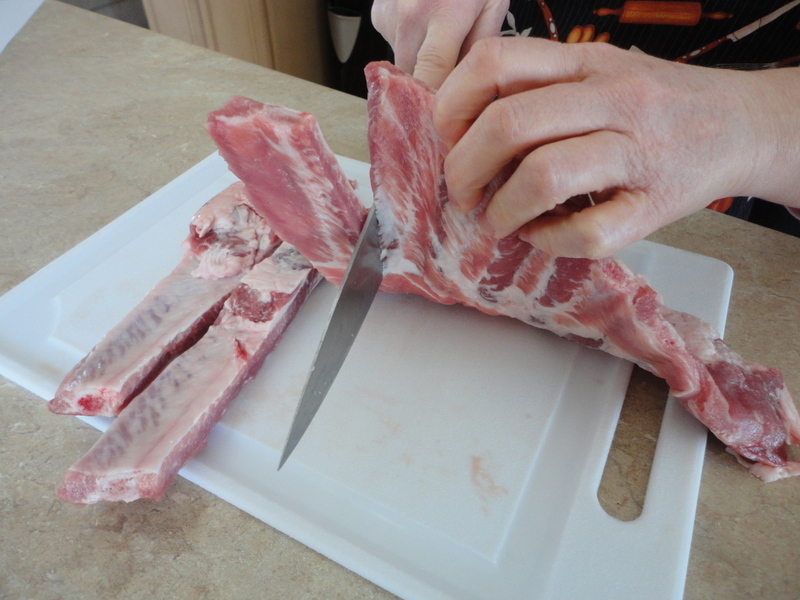 Cut the ribs into pieces, slicing in between each rib. 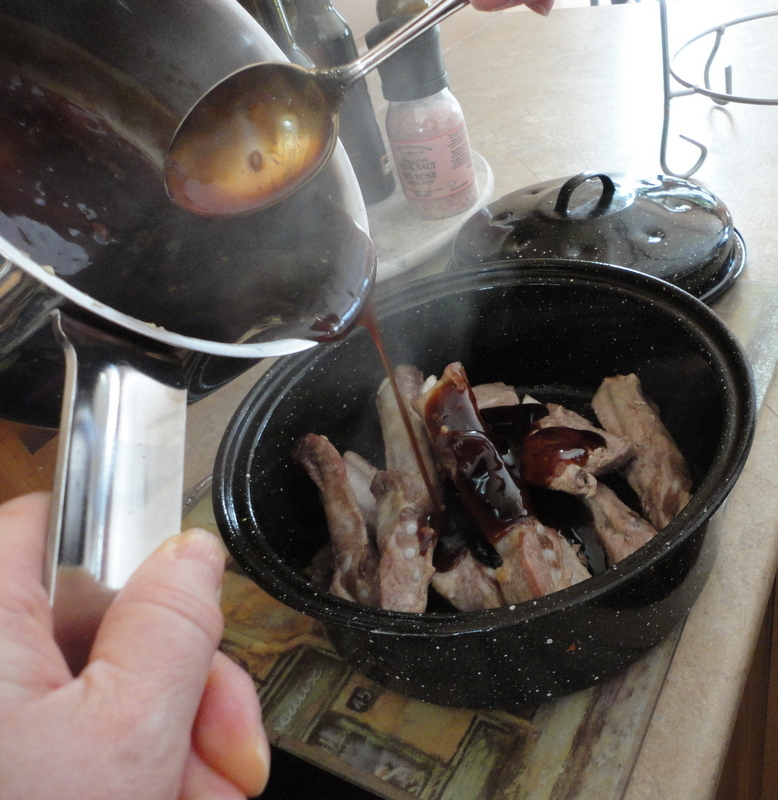 Place ribs in greased roaster. Cover and roast for ½ hour. Remove from oven and drain fat from roaster. 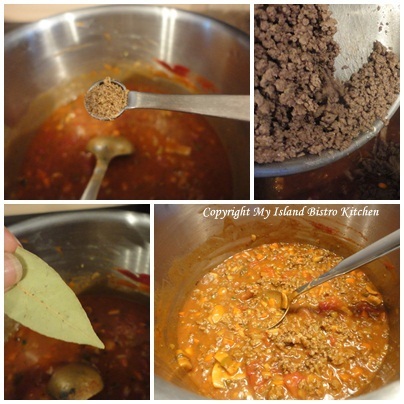 To make the sauce, combine the remaining ingredients in saucepan. Heat over medium-high heat just until mixture comes to a boil, stirring constantly. Remove from heat. Pour the hot sauce over the ribs. Cover and roast for 1 hour at 375F. Serves 2-3 (allowing 2-3 ribs per serving).